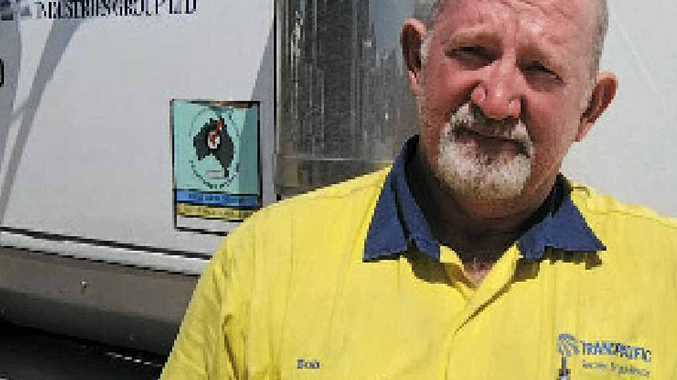 AS your Big Rigs correspondent was walking through the car park of a busy North Queensland roadhouse on March 22, an old mate in veteran truckie Bob Bonner yelled out. This writer last saw Bob about seven years ago as he was stopped beside the Palmerston Hwy between Atherton Tablelands and Innisfail. The 61-year-old now drives a Western Star 4800 powered by a Cat 550hp motor for NQ Resource Recovery. "I carry fuel between Townsville and Mount Isa and also get up to Karumba," he said. When away for days the company accommodates Bob and other drivers in motels. "I also take some food with me for the morning," he said. Bob rates the worst road as at Greenvale on the Gregory Development Hwy and between Mt Surprise and Georgetown on the way to Gulf of Carpentaria. Asked the most unusual thing to happen to him on the road, Bob said it occurred some years back. "At a rest area four naked lasses aged in their 20s asked myself and some other truckies to have our pics snapped with them and it caused a traffic jam," he said.